Throughout 2015, I have been involved in many different projects within the CRC. 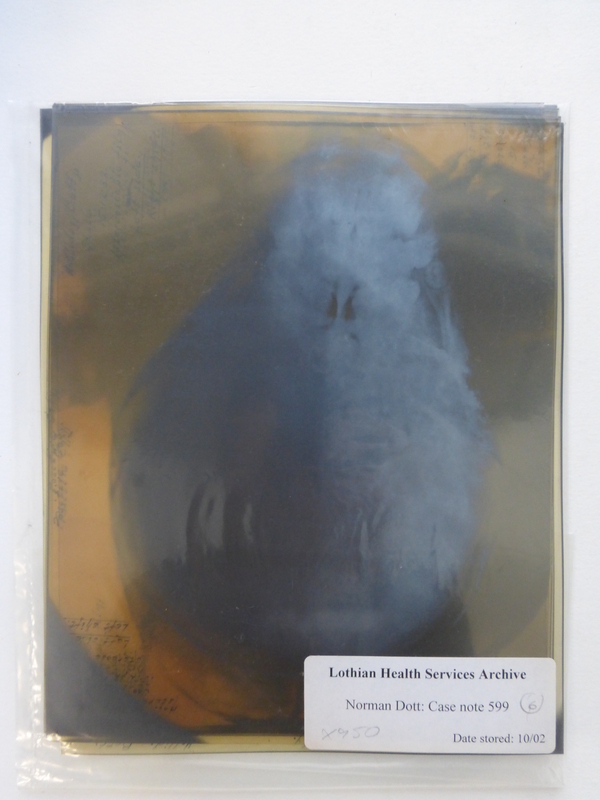 However, I have mostly been working with collections from the Lothian Health Services Archive (LHSA). Overall I have spent 4 months carrying out conservation work on their main collection, and spent 1 month working on a public engagement project. 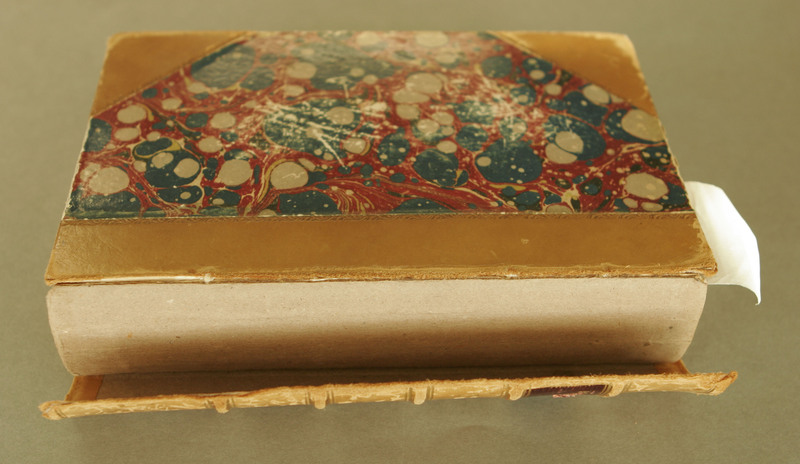 The majority of the work I have carried out has been on bound volumes. I have spent 25 days working on these items and have conserved 321 volumes. The conservation work aimed to stabilise the objects and prevent them from deteriorating further. 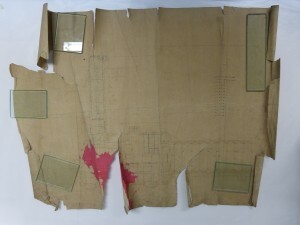 Techniques carried out included surface cleaning, consolidation of red rot using Klucel G in IMS, inner joint repair to reattach loose or detached boards, and reattaching damaged spines to volumes using a hollow. During this time, I have also worked on a few photo albums and scrapbooks. Often, the photographs had fallen out of the albums as the adhesive failed, so I reattached the photographs using hinges made from Japanese paper and wheat starch paste. Although the paper the album is made from is not ideal for the storage of photographs, I wanted to conserve the album as a whole, and keep the way it was originally intended to be viewed. I particularly enjoyed working with a scrapbook that belonged to Yvonne Fitzroy. The pages of the book had become cockled over time, which allowed for the ingress of surface dirt. 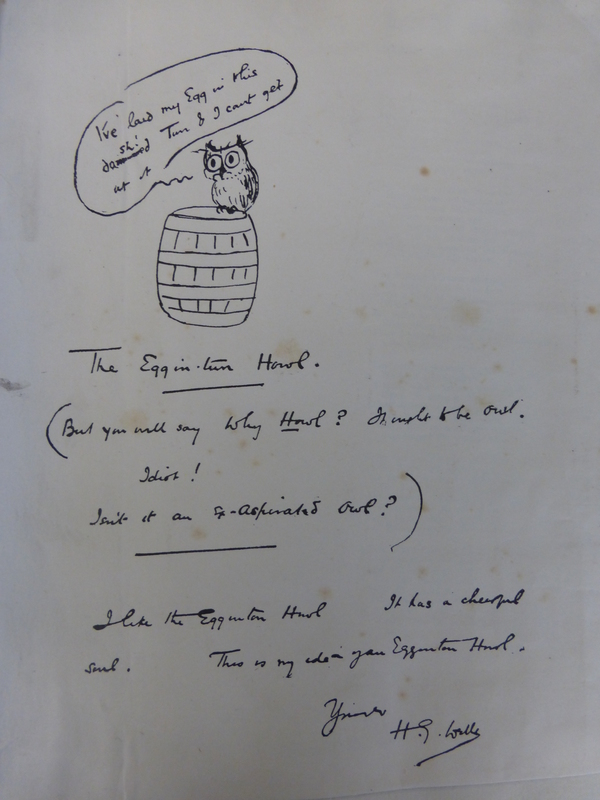 I cleaned each page using a smoke sponge and was delighted to come across a note and doodle from H.G. 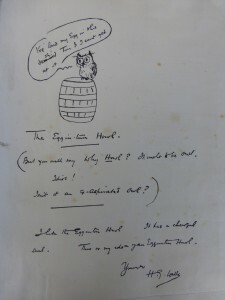 Wells on one page of the book. I have also rehoused 16 boxes of case notes, which had previously been stored in their original folders, loose on the shelf. I removed all the metal fasteners (paper clips, staples), realigned any creases and carried out tear repairs if necessary. I then rehoused the case notes in acid free single crease folders and placed them in an acid free box. X-rays are another collection I have been working with. I have sorted through 15 boxes of X-rays in preparation for frozen storage. 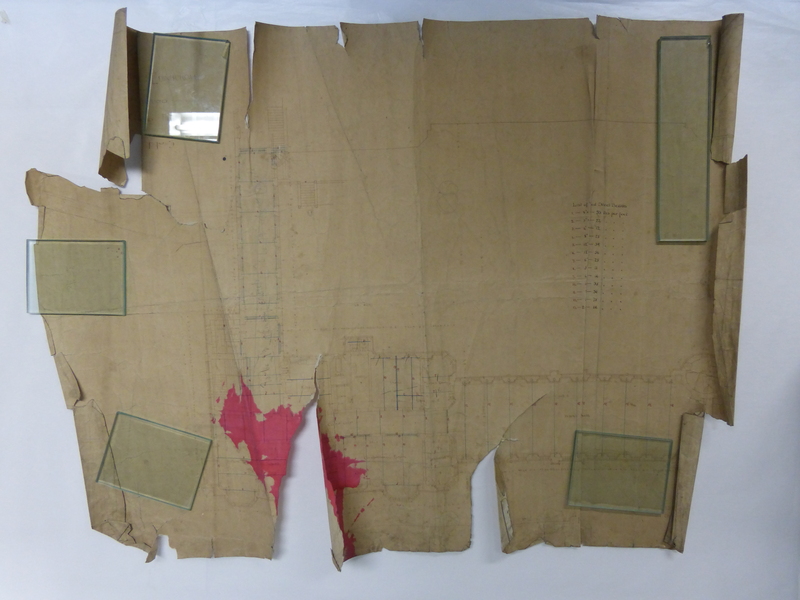 You can read more about the deterioration and storage of X-rays in the LHSA blog. 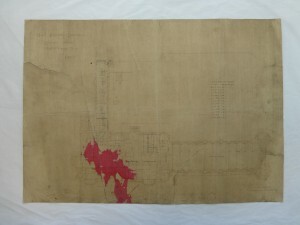 During this time, I have also been supervising conservation volunteer, Colette Bush, who has been working on a collection of architectural plans. She has surface cleaned each plan, repaired any tears and removed any paper accretions using a poultice. When this was complete, I humidified and flattened the plans and rehoused them in a polyester sleeve. 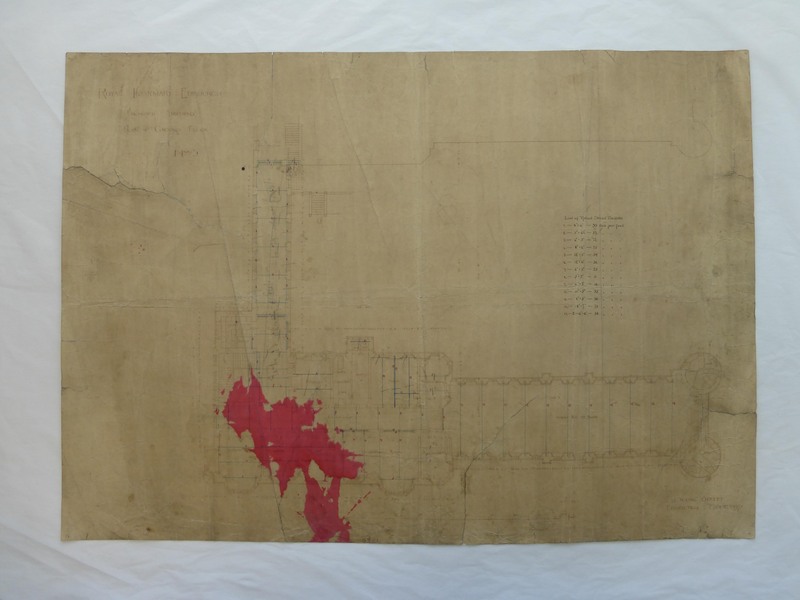 Together we have conserved 16 plans in this way. I’ve really enjoyed working with such a diverse collection and have learnt a lot on the way. I’m looking forward to seeing what new conservation challenges arise over the next year as I start working with new collections.